Your Home folder in OS X Yosemite is inside the Users folder. When the user logs on to this Mac, the contents of her Home folder appears whenever she clicks the Home icon in the Sidebar, chooses Go→Home, or uses the keyboard shortcut Shift+Command+H. Your Home folder is the most important folder for you as a user — or at least the one where you stash most of your files. Store all the files you create in subfolders within your Home folder — preferably, in subfolders in your Home/Documents folder. The advantage of doing so is that your Home/Documents folder is easy to find, and many programs use it as the default folder for opening or saving a file. When you open your Home folder, you see a Finder window with a little house icon and your short username in the title bar. Seeing your short username in the title bar tells you that you’re in your Home folder. Every user has a Home folder named after his or her short username (as specified in the Users & Groups System Preferences pane). 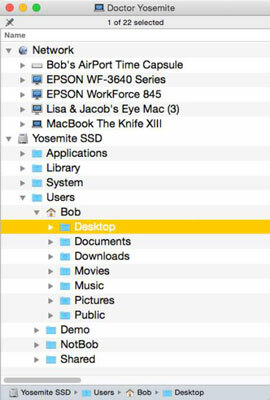 In the figure, you’ll see that the Home folder contains seven subfolders — Desktop, Documents, Downloads, Movies, Music, Pictures, and Public — and that the Home folder is named Bob. If your Mac has more than one user, you can see their Home folders in the Users folder (for example, NotBob), but OS X prevents you from opening files from or saving files to other users’ Home folders. Library: This Library folder is invisible in Yosemite. Rest assured that even though it’s hidden, it’s still one of the most important folders in your Home folder, containing Preferences (files containing the settings you create in System Preferences and other places), fonts available only to you, and other stuff that you — and only you — expect to use. Public: If others on your local area network (LAN) use file sharing to connect with your Mac, they can’t see or use the files or folders in your Home folder (unless you explicitly share them), but they can share files you store in your Home folder’s Public folder. If you decide that you don’t want an item on the Desktop anymore, delete it by dragging its icon from the Desktop folder to the Trash or by dragging its icon from the Desktop itself to the Trash. Both techniques yield the same effect: The file is in the Trash, where it remains until you empty the Trash. Or if you don’t want it on the Desktop anymore but don’t want to get rid of it either, you can drag it from the Desktop into any other folder you like. The other four folders that you should see in your Home folder are Downloads, Movies, Music, and Pictures. All these folders except Downloads are empty until you (or a program such as iTunes, GarageBand, iPhoto [or the Photos app that will replace it in 2015], or iMovie, which create files inside these folders automatically the first time you launch them) put something in these folders.